That means that their bloom set timing is triggered by a combination of day length and temperature. The most important trigger is the length of the day. Once the day length decreases to approximately twelve hours, the plant recognizes that it is time to bloom. Night temperature of 55° to 65° F. should accompany the short day. 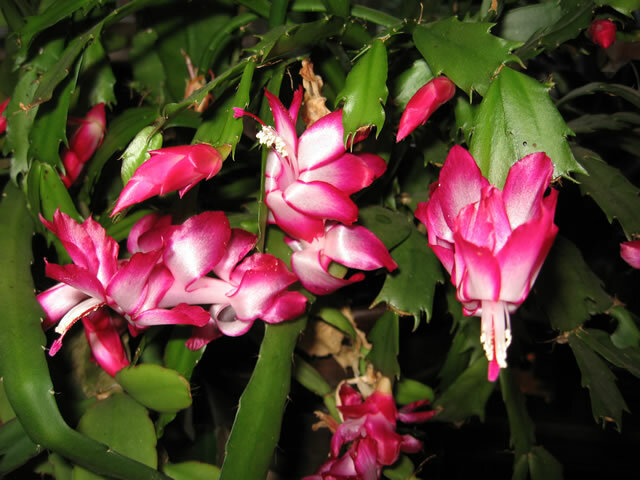 There are six species of Schlumbergera that are all native to southwestern Brazil. The genus was named after Frederic Schlumberger, a 19th century French cactus collector who discovered the original Christmas Cactus, Schlumbergera buckleyi. Most Christmas Cactus sold today are hybrids of this red flowering species. Schlumbergera are epiphytic plants with flattened, 2" leaf-like stem segments. In nature, they reside cordially with the Orchids and Epiphyllums in the crotches and branches of their host jungle trees. Look at the calendar and you decide what you want to call your Holiday Cactus because Schlumbergera plants are capable of blooming at almost any time of the year, by manipulating their light and temperature. The natural changes of daylight hours will usually trigger blooming of these different Holiday Cactus to coincide with their named holiday. Like most epiphytic cacti, Christmas Cactus like water but don't like to be soaked. They can grow with very little light and that's why they make good house plants, however, for good flower production your Christmas Cactus will require bright light or full sun in the fall months. Plant them in a soil mix consisting of 3 parts peat moss, 1 part loam and 1 part coarse sand or perlite. Schlumbergeras bloom best when they are somewhat rootbound and crowded. Plant them in a pot that is wider than it is tall. When repotting, only move up one size of planter. The soil should be kept moist during the spring and summer. Fertilize every 2 weeks during this time with a diluted, ½ strength houseplant fertilizer. In the fall, reduce watering and keep your Christmas Cactus cooler 60°-65° at night. Protect from artificial light during night time hours. Increase watering and resume feeding when the flower buds appear. 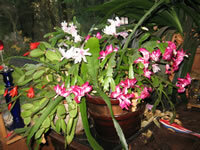 Christmas Cactus and other Holiday Cactus do not like to be moved to a different location once they set their buds. Environmental changes can cause the flowers to rapidly drop. 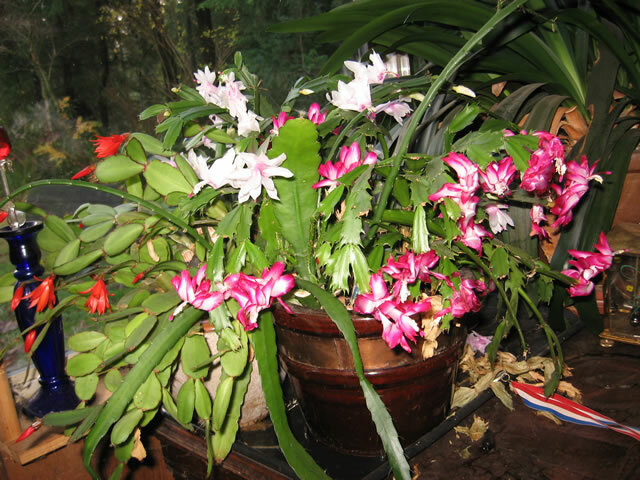 Schlumbergera are easily propagated by cuttings taken in the spring or summer. Cut (or twist off) single or multiple segments from the tips of the branches. Keep track of which end is 'up'. Set the segments in a cool, dry location for a week to let the cuts callous over. Insert the base of the cutting ½" deep in moist sand or vermiculite mix. and sometimes goes by the name of the Crab Cactus. The most distinguishing trait of S.truncata is the claw toothed edges on each segment. Flowers may be pink, red, orange or white. Christmas Cactus (white, top center in first photo) have a much less pronounced 'claw' on the edges of the leaf segments. The majority of Christmas Cactus on the market today are hybrids of the original, red flowering Schlumbergera buckleyi. Flowers may be pink, red, orange or white or lavender.